Today, I am bringing you two teasers, just because! "We kiss as if the bloody room had burst on fire," he interrupted. "We kiss as if making love didn't exist and kissing was all there was." 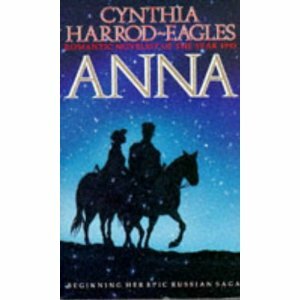 The second teaser come from Anna by Cynthia Harrod Eagles. This was actually due back at the library yesterday and I really have quite a lot to go, but I am determined to finish it relatively quickly because I am really enjoying it. Cynthia Harrod Eagles is more well known for her Morland Dynasty series of novels. This one is set in Russia in the early 1800s. I d love books that are set in St Petersburg in particular, and so far there has been quite a lot set there. The author can be a bit heavy on the description, but I definitely want to know what happens next! The teaser comes from page 166. "It does look very exciting," Anne said, "but I don't know if it is quite proper. Do ladies toboggan in public?" "Now you have said the one thing that would persuade me," he grinned. "Proper? Is that my English Anna, two thousand miles from home, wondering about propriety?" By the way, check out my blogoversary giveaway! All the details are here, and if you are interested in sharing some of your favourite holiday memories, songs, recipes, books, traditions etc, then please sign up to the Virtual Advent Tour. It is a lovely teaser isn't it! As soon as I read it I knew that I wanted to share it. I like both the teaser! Oh I hope you can get Anna finished. It is very good and lots of excitement yet to come. I have the first book in the Morland Dynasty series, and am looking forward to it. I hope that you enjoy Anna! I like the kissing teaser! That must be some kiss! These are both very tempting...enjoy the books.